Ayodhya has a special place in the hearts of many Hindus. According to Hindu mythology, Lord Ram was born there and it's the setting for "The Ramayana," the great epic that tells the story of Ram's inspiring life. Ram is worshiped as the seventh incarnation of Lord Vishnu, the preserver of the universe. In addition, the Garuda Purana (a Hindu scripture) lists Ayodhya as one of the sapta puri (seven holiest cities) that can provide moksha (liberation from the cycle of death and rebirth). It's also the place where five of Jainism’s tirthankars (religious teachers) were born. This makes the town an important pilgrimage destination. 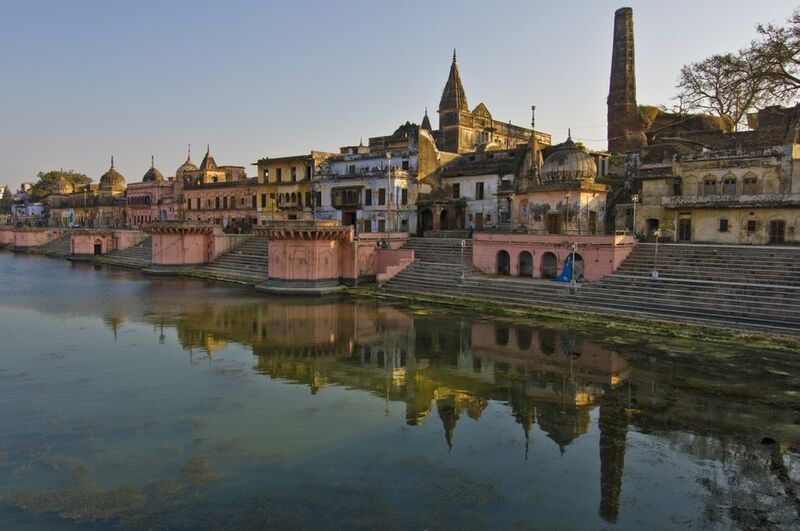 Ayodhya is an interesting place for travelers who like to get off-the-beaten track as well. Not only is it delightfully devoid of foreign tourists, it's an atmospheric and peaceful town that shows how India has assimilated different religions into its social fabric. You'd never guess that it's been the site of bitter and violent communal disputes. Read on to learn more about Ayodhya's history and how to visit it in this complete guide. In December 1992, a political rally in Ayodhya turned into a riot, during which frenzied Hindu extremists destroyed a 16th century Mughal-era mosque known as Babri Masjid (Babur's Mosque). Their reason was that the mosque had been built on the sacred spot where Lord Ram was born. This is said to have happened after Mughal commander Mir Baqi tore down a preexisting Hindu temple to construct the mosque for emperor Babur. The emperor had conquered most of North India, and the landmark mosque had distinctive Tughlaq-style architecture similar to mosques in the Delhi Sultanate. Hindus and Muslims both worshiped in the mosque premises until 1855, when there was a clash between the two religious groups. This resulted in British rulers segregating the premises and preventing Hindus from entering the inner part. The Hindu group eventually filed a claim to build another temple next to the mosque in 1885, but the court rejected it. Decades later, divisive political movements fueled the conflict. In 1949, Hindu activists broke into the mosque, and placed idols of Lord Ram and his wife Sita inside. A local official declared that their removal would spark communal unrest. The government locked the place up, so that the public couldn't enter, but permitted Hindu priests to perform daily puja (rituals) for the idols.The site remained locked and in dispute, as religious groups filed numerous lawsuits demanding control of it. A new political movement in the 1980s aimed to "liberate" the birthplace of Lord Ram and "reclaim" it for Hindus. It gained momentum when a 1986 court order allowed the gates of the mosque to be reopened and Hindus to worship inside. In 1990, a political party organized a procession to Ayodhya to generate support for the movement. Activists attempted to attack the mosque but the police and paramilitary were able to avert it. The successful attack in 1992 provoked reactionary riots across India, resulting in thousands of lives being lost. The Indian government set up a commission to investigate the circumstances that led to the demolition of the mosque. In 2003, the Allahabad High Court ordered the Archeological Survey of India to excavate the site, to see if there was any evidence of a Hindu temple. Although traces of a large structure were found underneath it, Muslims disputed the findings. Meanwhile, Hindus made a makeshift temple on the site, named Ram Janambhoomi (Ram's Birthplace). In 2005, Muslim terrorists attacked it with explosives. In 2007, the head of the temple received death threats. The Allahabad High Court intervened in 2010, declaring that the land should be split equally between Hindus, Muslims, and the Nirmohi Akhara (a group of Hindu ascetics devoted to Lord Ram). The site of the mosque was given to the Hindus. However, religious groups appealed the ruling, and it was suspended by the Supreme Court. The latest court hearing took place in March 2019 and the dispute was referred to a panel for mediation. Unfortunately, Ayodhya's early history is sketchy and uncertain. Archeological evidence indicates that present-day Ayodhya was previously the town of Saketa during the time of Lord Buddha. Buddhist scriptures say the Buddha lived and preached there for a while. It's thought that Gupta king "Vikramaditya" Skanda Gupta, who was an ardent devotee of Lord Ram, renamed it in the 5th century. There's some debate over whether the ancient Ayodhya in "The Ramayana," which is said to have been lost for centuries, is actually the same town though. Nevertheless, it wasn't until Gahadavala dynasty rulers built several Vishnu temples in Ayodhya in the 11th and 12th centuries that pilgrims slowly began arriving there. The worship of Lord Ram rose to prominence in Ayodhya after the 15th century, when mythological stories about him grew in popularity and the town was accepted as his birthplace. Ayodhya is located in the north Indian state of Uttar Pradesh, alongside the Saryu River. It's about two and a half hours east of Lucknow (the capital of Uttar Pradesh), and five and a half hours northwest of Varanasi. The nearest major airport is in Lucknow, and it's well connected to other cities in India. Hence, Ayodhya is most conveniently visited on a side trip from Lucknow. Ayodhya has railway station but the one at Faizabad, about 20 minutes away, is bigger. Express and Super Fast trains from major cities all over India stop there. If you're traveling by train from Lucknow, get an early start by taking the 13484 Farakka Express. This train departs Lucknow at 7:40 a.m. and arrives in Ayodhya at 10:20 a.m. It runs on Mondays, Wednesdays, Fridays and Saturdays. The daily 13010 Doon Express departs Lucknow a bit later, at 8:45 a.m., and arrives in Ayodhya at 11:30 a.m. Delays can be an issue though, with the train often reaching Lucknow an hour or two late (it originates in Dehradun in Uttarakhand). Here's a list of all the train options. Alternatively, a taxi from Lucknow to Ayodhya will cost about 3,000 rupees one way. It's possible book with Uber. The bus is a cheaper budget option. There are regular services from Lucknow to Faizabad and Ayodhya. The Uttar Pradesh State Road Transport Corporation operates special premium air-conditioned Shatabdi and Jan Rath bus services. The cost of tickets ranges from about 230-350 rupees. Ayodhya's main attractions are its serene riverside ghats (steps leading down to the water) and numerous temples. The town isn't very big, so you can visit them on foot. The winding lanes are lined with characterful old-world homes adorned with fine carvings. For those who prefer to go on a guided walking tour, this Mokshdayni Ayodhya Walk conducted by Tornos is recommended. Otherwise, start at ornate and vibrant Hanuman Garhi, which is the closest temple to the main road. This prominent fortress temple is dedicated to Lord Hanuman (the monkey god, who helped Lord Ram in his fight against evil). Legend has it that he used to live there and protect Ayodhya. The temple is particularly busy on Tuesdays, the main day of Hanuman worship. Be careful of monkeys who try to steal the prasad (food offerings made to the god). Continue on to evocative Dashrath Mahal, situated a hundred or so meters up the road from Hanuman Garhi. This temple is known as the palace of Ram’s father. Inside the imposing and colorful arched entrance way, the environment is uplifting with saffron-clad holy men chanting and musicians playing bhajans (devotional songs). A couple of minutes walk away, Kanak Bhavan is an imposing golden palace temple that's said to have been a wedding present to Ram's wife Sita from his stepmother Kaikeyi. The current version was built in 1891 by Rani Krishnabhanu Kunwari of Orccha. It's the highlight of Ayodhya's attractions. The ambiance there is also relaxing, with people often singing and playing music. The temple is open from 9 a.m. to noon and 4 p.m. to 9 p.m. in winter. Summer hours are slightly different (check the website for details). Turn left just before Dashrath Mahal and walk a short distance to get to Ayodhya's most contentious temple complex, Ram Janambhoomi. Understandably, security is tight and entry is restricted. You'll need to show your passport (or other suitable identification) and leave your belongings outside in a locker. The complex is open from 7 a.m. to 11 a.m. and 2 p.m. to 6 p.m. As you enter it, near the first checkpoint, you'll come across a small shrine known as Sita ki Rasoi (Sita's Kitchen). This symbolic kitchen has a corner that's set up with mock old-fashioned utensils, rolling pin and rolling plate. A 30-minute stroll will take you to the riverbank and ghats. Some have special significance and are particularly auspicious, such as Lakshman Ghat (where Ram's brother Lakshman bathed) and Swarg Dwar (also known as Ram Ghat, where Lord Ram was cremated). Many ghats are grouped along a scenic stretch called Ram ki Paidi. This precinct includes Nageshwarnath temple, which is dedicated to Lord Shiva and is said to have been established by Ram's son Kush. Ideally, be at the ghats around sunset. Go out on a boat in the river and return in time for the uplifting Saryu Aarti (devotional fire ritual). The ghats are beautifully illuminated in the evening. A grand Diwali festival celebration takes place there in October or November, with the lighting of thousands of earthen lamps. Stop by the informative Ayodhya Research Center at Tulsi Smarak Bhavan to learn about the culture and heritage of Ayodhya. The story of "The Ramayana" is narrated in various Indian art forms, and there's a daily free performance of the Ram Lila from 6 p.m. to 9 p.m.
As you wander through the streets, you're also likely to encounter captivating murals with scenes from "The Ramayana" on the sides of buildings. Fine arts students from across Uttar Pradesh painted them on 100 walls as part of the 2018 Ayodhya Art Festival. Other attractions in Ayodhya include various kunds (wells) built in honor of characters from "The Ramayana," and a cluster of historic Sikh gurudwaras (places of worship). Three Sikh gurus (Guru Nanak, Guru Teg Bahadur, and Guru Govind Singh) are believed to have passed through Ayodhya. If you're planning on visiting Ayodhya in late March or early April, try to attend the Ram Navami festival. It celebrates the birthday of Lord Ram. Thousands of pilgrims come to take a holy dip in the river, and there's chariot procession and fair too. There are limited places to stay in Ayodhya. Ramprastha Hotel is your best bet, with rooms from around 1,000 rupees per night. You'll find more accommodations in nearby Faizabad, although none are really outstanding. Kohinoor Palace heritage hotel is the pick of them. Expect to pay about 2,000 rupees per night. Hotel Krishna Palace is also popular. It's close to the railway station and has a new block of rooms. Rates start from around 2,500 rupees per night. The options in Lucknow are much more appealing. The Lebua is a beautiful luxury boutique heritage property, priced from about 10,000 rupees per night including breakfast. FabHotel Heritage Charbagh is a cheaper, conveniently located heritage hotel costing about 2,500 rupees per night upwards including breakfast. The new Go Awadh hostel is recommended for backpackers and budget travelers. Expect to pay 700 rupees per night for a bed in a dorm and 1,800 rupees for a private double room.